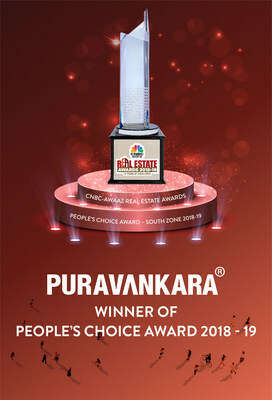 India’s most trusted developer, Puravankara Limited bagged the prestigious ‘People’s Choice Award’ for the Favourite Real Estate Developer -South Zone at CNBC-Awaaz India’s prestigious Real Estate Awards 2018-19. The award is presented to the most trusted brand in the real estate sector in South India, based on an online voting system devised by the channel. In this category, Puravankara Limited secured the highest votes ahead of all the nominations for the South of India. CNBC-AWAAZ Real Estate Awards recognises those projects that have been creating a mark for themselves. For the 13th year in a row, these awards have put the spotlight on the builders, architects who are working tirelessly to bring these projects to fruition. The chief guest at the ceremony included Shri. Banwarilal Purohit – Hon’ble Governor of Tamil Nadu. Other honourable jury members were Mr. Keki Mistry – Vice Chairman & CEO – HDFC Ltd., Mr. Sunil Rohokale – CEO & Managing Director – ASK Group, Mr. Gulam Zia – Executive Director at Knight Frank, Mr. Anuj Puri – Chairman – ANAROCK Property Consultants Pvt. Ltd., Mr. Anil Harish – Partner – D. M. Harish & Co. and many more. CNBC-AWAAZ Real Estate Awards recognises and rewards the best real estate projects and developers in the country. Driven by stringent criteria and a robust methodology along with a comprehensive multi-city survey and a two-phased jury process, these awards identify India’s best most preferred projects and the winning teams behind them. The People’s Choice Awards – Zonal for South included a transparent voting system where online visitors had to select their favourite builder amongst others. Puravankara Limited is a leading real estate company in India, with presence in Bengaluru, Kochi, Chennai, Coimbatore, Mangaluru, Hyderabad, Mysore, Mumbai, Pune and Goa. The company has close to 38 million square feet of projects which are completed and delivered out of which 62 are residential and five commercial projects. With close to 23 million square feet of projects which are under development, the total land assets of the company nears 70 million square feet. The company is listed on the National Stock Exchange of India Limited (NSE) and the Bombay Stock Exchange (BSE). Puravankara has won the Best Developer of the Year 2017 for South India.